(Megan Skinner registered 2008, intro 2009) Early-Midseason Dor Dip, 3.5”, 26”. Seedling D01-005M (FORTY THIEVES x (ALPINE MIST x D462)). Bud count 10, 2-way branching. not fragrant. Fertile both ways. ANNEALED METAL EYE is notable for its intense metallic-shine purple eye, which it passes to its seedlings. 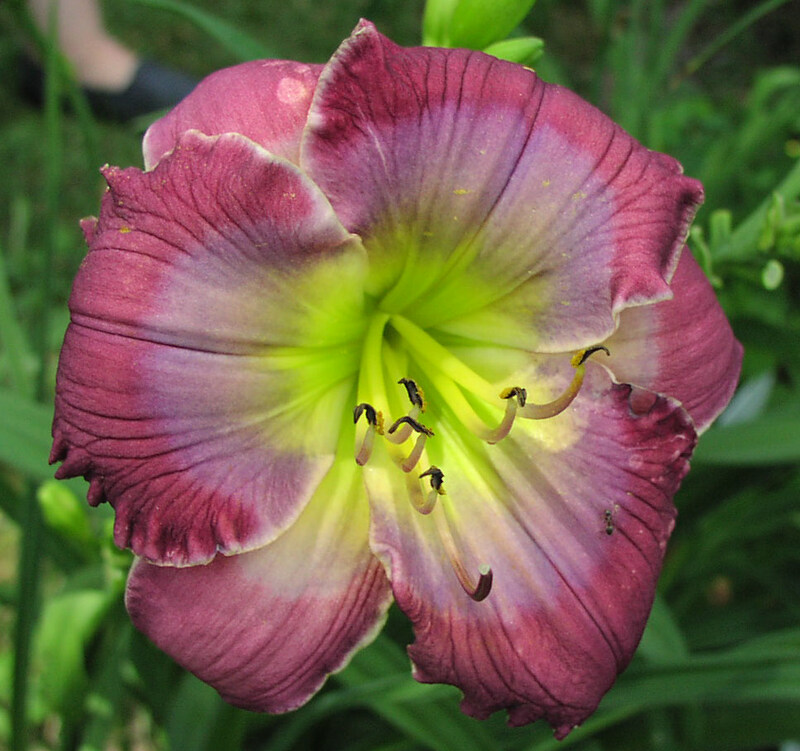 Overall, it has buff pink petals, and the deep purple eye has a maroon edge over a green throat. 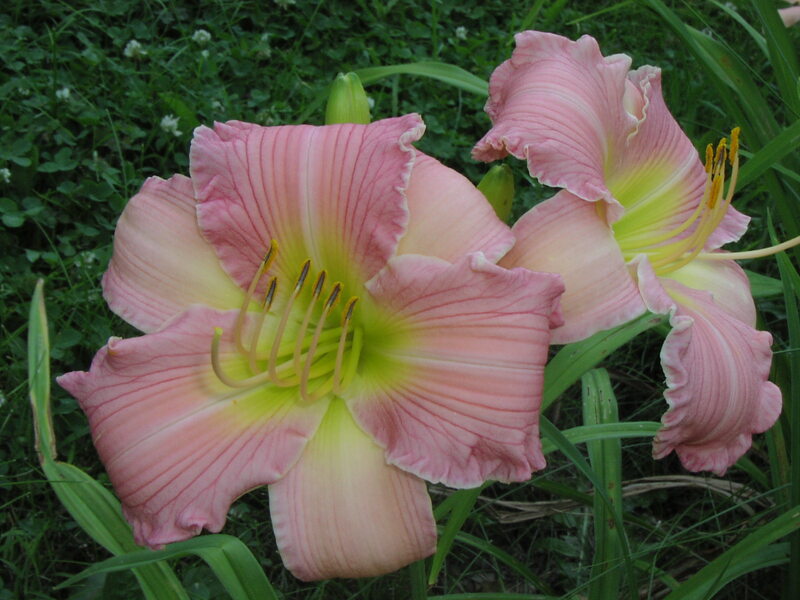 For those who follow ancestry in daylilies, D462 is a full sibling to HOT TO TROT; its parents are ((JANET GAYLE x FAIRY TALE PINK) x CAJUN LADY) X (ADAMS STREET x CHORUS LINE). 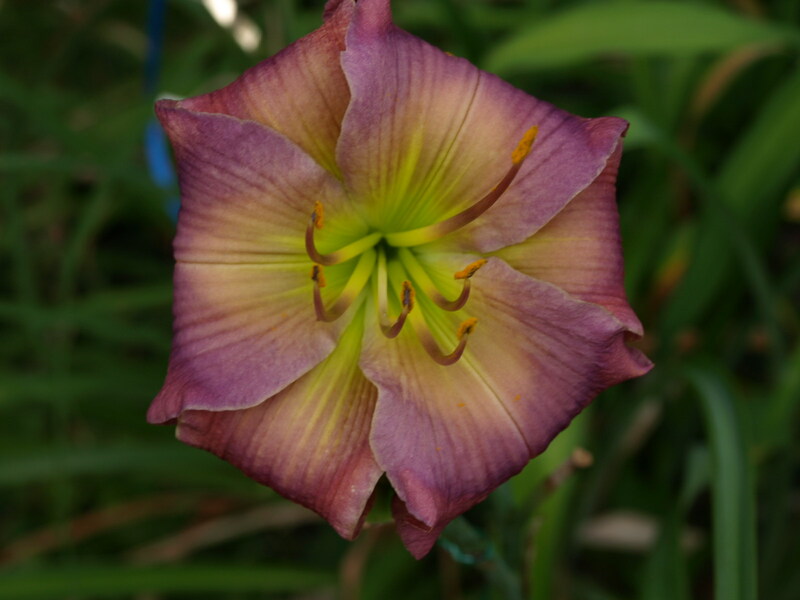 When we began hybridizing in the late 1980’s, we regularly bought seeds from Fran Harding in central Virginia. It gave us an excellent start to getting locally hardy (if not usually “finished”) breeding stock with a wider variety of modern introductions than we could afford. AWAKEN WITH KISSES (Megan Skinner, registered 2002, intro 2002) M Dor Dip, 22”, 4”. Seedling D508R (JANICE BROWN X BABY BLUES). Nocturnal and very extended bloom. Bud count 20 on 2 branches, fragrant. Easy pod parent. Pollen is fertile, but must be collected at night before dew wets it. Reblooms. 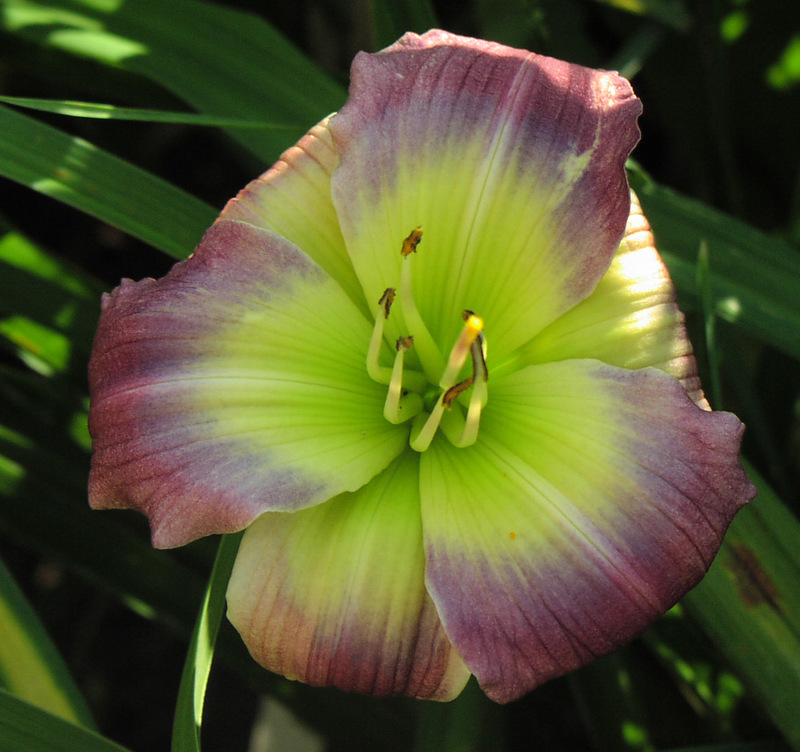 Diamond-dusted pink with bright red and rose eye over green throat. The complex eyezone from BABY BLUES broke the standard JANICE BROWN red eye into distinct color zones, which gives the flower a special “pop” in the garden and makes it a good parent to work toward complex eyes. AWAKEN WITH KISSES sometimes doubles early in the season. Foliage is dark-green and pristine all through our cold spring. It clumps quickly and vigorously. One of the special joys of AWAKEN WITH KISSES is that when it opens just after sunset, yesterday’s blooms are still firm and attractive, though faded. It makes a lovely sight to watch on your patio. I love the “extra extended” nocturnal daylilies. AWK begins to open right at dusk, being about ¾ open by 8PM. By suppertime the next day, the petal fades from pink to pinkish beige, and the eye fades from intense red to medium pink, but the flower as a whole stays attractive and firm until about 8PM. This is a wonderful trait which deserves more attention. It’s of no use to the folks who deadhead daily, but is fantastic for commuters who want to see nice bloom even on weekdays. BALLOONS RISING (Megan Skinner registered 2010, intro 2011) Midseason SEv dip, 4.5”, 32”, bloom nocturnal and extended, CMO. 16 buds on 3-way branches, fragrant. Seedling D02-017a-02 (MY NIECE KATRICE X LAVENDER BLUE BABY). Fertile both ways. Reblooms. BALLOONS RISING has reddish/rose purple petals, with an arched watermark of lavender, then an interior watermark of pink-peach above a radiating green throat. As hoped, BALLOONS RISING picked up the larger size, large watermark and throat, and textural radiating of MY NIECE KATRICE while acquiring color and plant habit from LAVENDER BLUE BABY. BALLOONS RISING is almost always recurved, either as a disk on a cold day (52F) or a sphere on a warm one. From the side, on a warm day, it looks like a purple hot-air balloon, with the lavender and salmon watermarks ornamenting its top. BERRIES WITH LIME (Megan Skinner, registered 2006, intro 2006) Midseason SEv Dip, 19”, 3.75” , Seedling D712 (MORRIE OTTE X BABY BLUES). Bud count 9, branching 2-way, not fragrant. Nocturnal with extended bloom day. Pod fertile. BERRIES WITH LIME is light mulberry with blueberry watermark above large green throat. 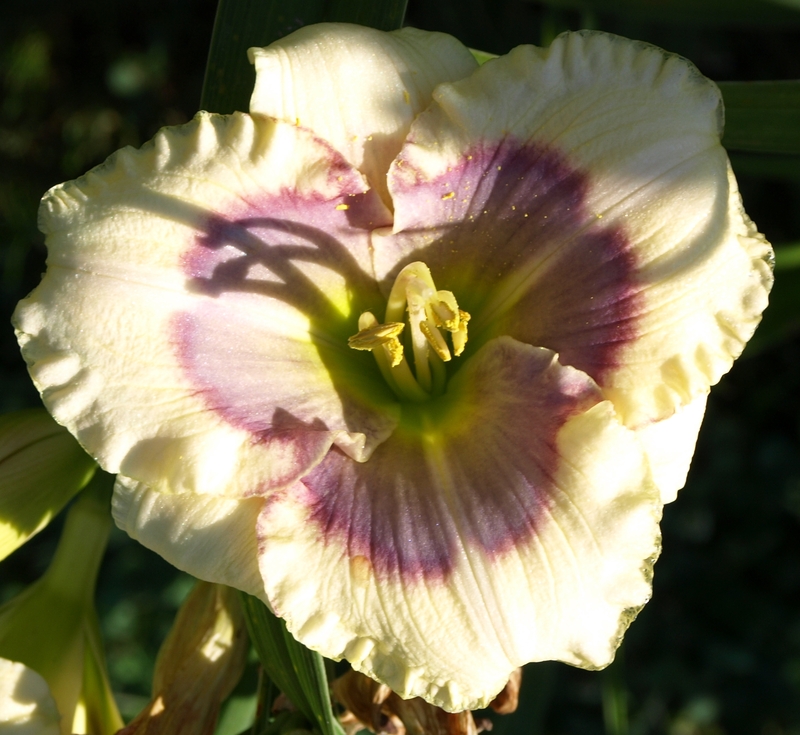 Pale lavender tones as well as pattern on sepals. Once I got Grace Stamile’s BABY BLUES, I threw it on every dip showing an eye or watermark and a pistil. Sure enough, it was the magic wand that breaks the colors in the other parent into many layers. BERRIES WITH LIME is too soft to recommend for growing in places much colder than my zone 6, but it produced nicer and hardier seedlings. 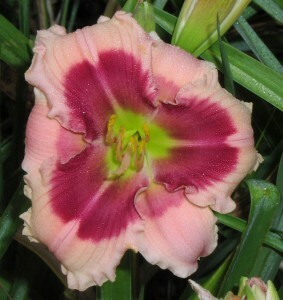 (Megan Skinner, registered 2009, intro 2010) Midseason Dor Dip, 25”, 3.5”, not fragrant. Seedling D920t (BLUE MOON RISING X (SHINING EYES x BABY BLUES)). Bud count 37 on 4-way branching. Pod fertile. Cream with light lavender eye and darker pencil edge above lime throat. 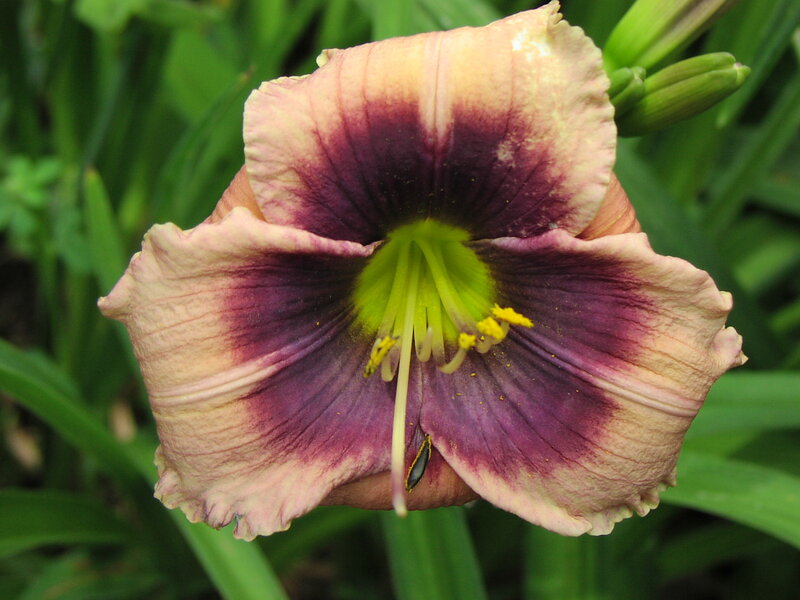 Although CALLISTA’S CRYSTAL is far from my goal of reproducing the best of the new blue-eyed diploids, it was designed as a bridge plant to remake those short, small and tender beauties tall, mid-sized (and eventually large-flowered) and northern hardy. As for the name …any fans of Marion Zimmer Bradley’s DARKOVER fantasy/sf/romance series out there? CALLISTA’S CRYSTAL and MARGOLI’S MATRIX were named for the glowing blue starstones used by the leroni. (Megan Skinner, reg 1999, intro 1999) M Dor Dip, 36”, 5 ¾” Sdlg 153SE (FAIRY TALE PINK X ADAMS STREET), not fragrant, 22 buds on 3 branches. Fertile both ways. 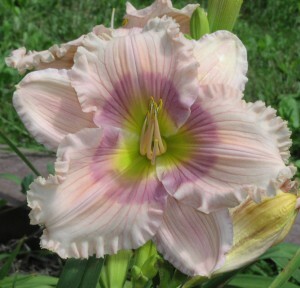 DABO GIRL is a diamond dusted pinkish melon with a medium-dark rose eye. The throat blends with the rose eye to make an orange zone, then yellow, and finally green. The ruffles and petal grooving make DG sculptured in appearance, especially given its fantastic substance. DABO GIRL is unusual because it is both diurnal opener and extended. It waits for sunlight to fall on the bud, which in our treed neighborhood is 9AM. However, it is still technically “extended bloom”, since it stays beautiful and firm for 16 hours, until after 1AM. 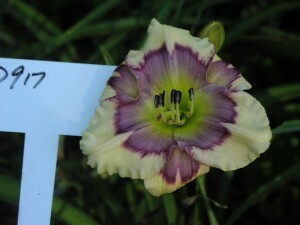 (How’s that for odd application of daylily classifications?!) Megan’s a night owl, and often brings in an unfertilized flower for company in the late evening. DABO GIRL was our first introduction, and we made one small naming mistake. We were naming it for the lovely woman who ran the Dabo wheel in Quark’s bar in Star Trek – Next Generation. I planned to spell it ‘Dhabbo Girl’, which looked exotic and leads you to pronounce it correctly as DAH-boh. At the last minute, I checked the Trek official website, and “fixed” the name to their usage. Oh, well. 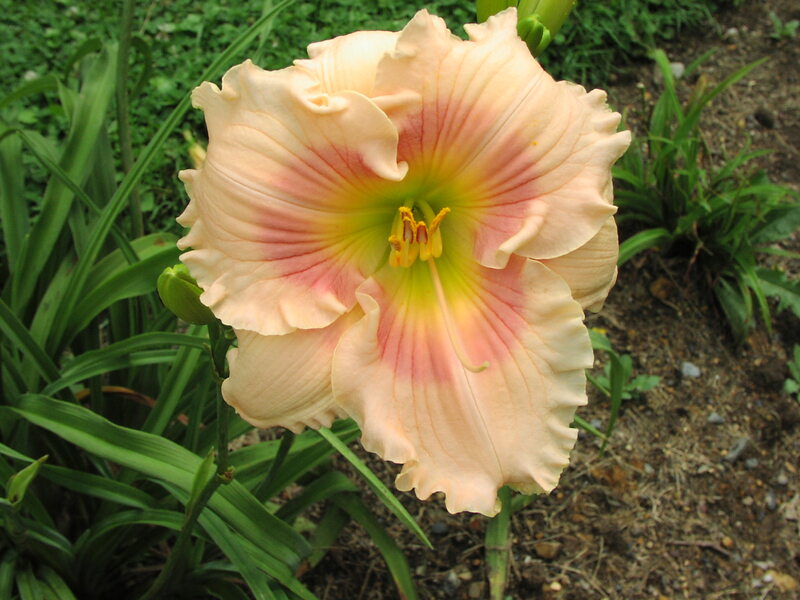 After all these years, DABO GIRL isn’t modern any more, but it’s still a pretty garden flower. It’s very northern hardy and vigorous, and makes lovely seedlings which pass down the sculptural texture, firm substance, and long bloom day. (Megan Skinner, registered 2010, intro 2010) Mid-Late Dor Dip, 23”, 2.875 Sdlg D01-006K ((SILOAM URY WINNIFORD x SILOAM FAIRY TALE) X BLUE MOON RISING). Not fragrant, bud count 20 on 3-way branching, easily pod fertile, pollen difficult. EYE OF THE AMETHYST is one of my few true small-flowered introductions. It has pink petals and a purple eye (with raspberry pencil edge) that I think wants to become patterned. 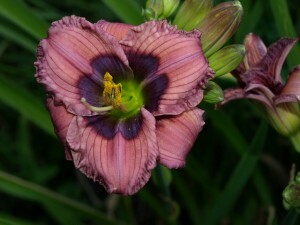 The intersection between the eye and the green throat is light orange, and the eye on the sepals is jagged. The overall eye is triangular, and notches at the midrib in a pattern that I (a Pennsylvanian) think of as a “keystone”. Mike and Ruth Kelly first got Ron interested in daylilies. Mike, a chemical engineering professor at Villanova, consulted at Air Products, where Ron worked as a chemical engineer. Along with fall dig-out gifts and surplus catalogs, Mike also, in 1987, brought Ron half a dozen newly sprouted seedlings to try out. These seedlings, which include SHINING EYES, became part of the foundation of our blue- and complex- eyed program. 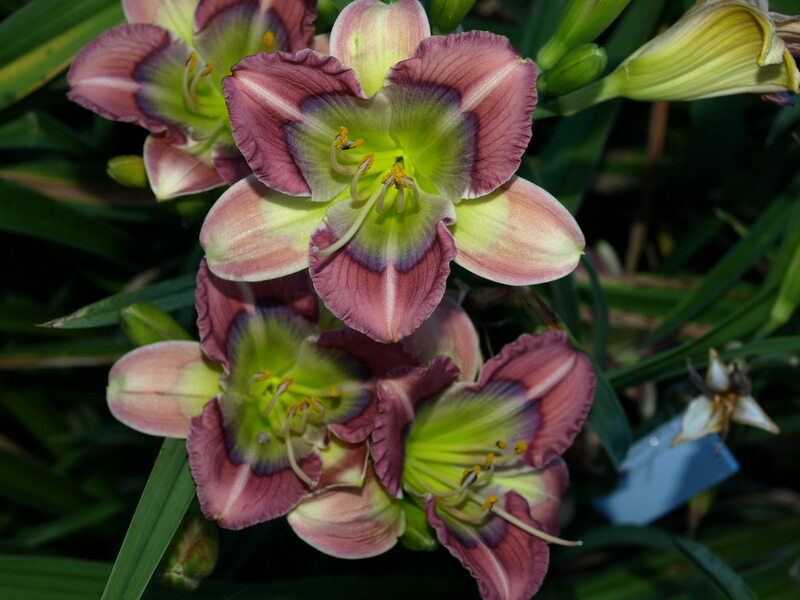 (Megan Skinner registered 2004, intro 2004) Midseason, Dor Dip 36” 5.5” Seedling D462JP (((JANET GAYLE x FAIRY TALE PINK) x CAJUN LADY) X (ADAMS STREET X CHORUS LINE)) Fragrant, bud count 9 on 3-way branching, extended bloom, fertile both ways. 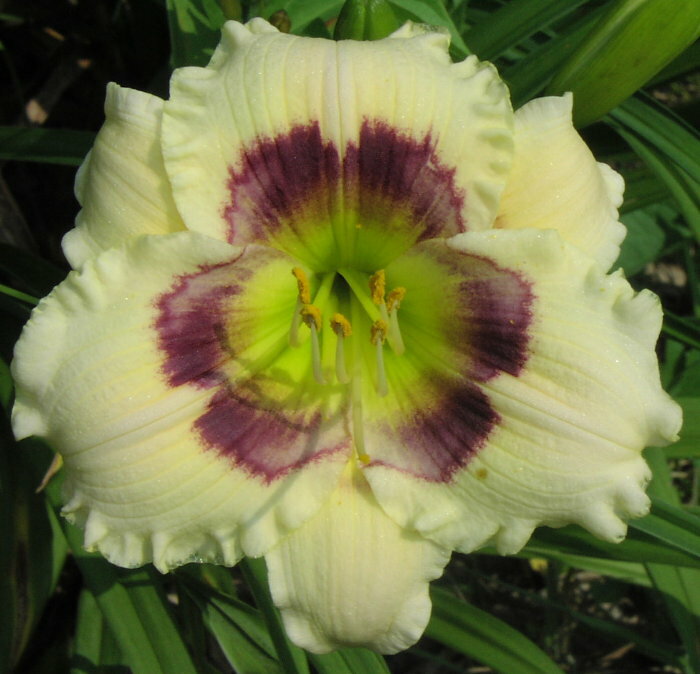 A bright salmon pink in hot weather, and a clear dark baby pink in cool weather, HOT TO TROT is enhanced by white midribs and edge and petal-long sculptured lines radiating from the chartreuse throat. Well recurved, a lovely and hardy plant. Some years it blooms I the early season, which is why I named it HOT TO TROT, but its season wasn’t consistent enough to register it as an early-season bloomer. Excellent parent, with future intros still on the way. 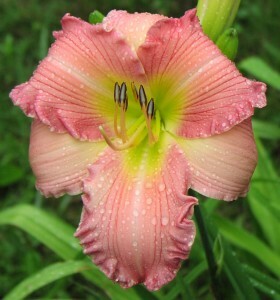 (Megan Skinner registered 2006 intro 2007) Midseason Dor Dip, 24”, 5.5” Seedling D810 (AWAKEN WITH KISSES X RUFFLED MASTERPIECE) Fragrant, bud count 18 on 2-way branching, fertile both ways. KISSES DAWN TO DUSK is a diamond-dusted cream with a wide rose eye with tangerine base, above green throat. 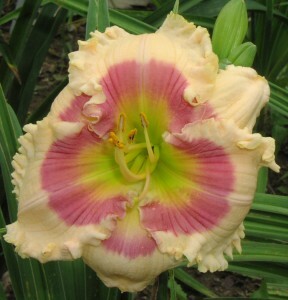 Nicely ruffled, nocturnal and extended bloom, fantastic substance. (Megan Skinner, registered 2009, intro 2010) Late Dor Dip, 25”, 4”, seedling D706AH (SHINING EYES X (BABY BLUES x JANICE BROWN)) not fragrant, bud count 27 on 4 branches, fertile both ways. Cream with hazy burgundy eye and burgundy pencil edge, yellow above green throat, partial burgundy picotee. LATE SUMMER HAZE is a nice garden flower. 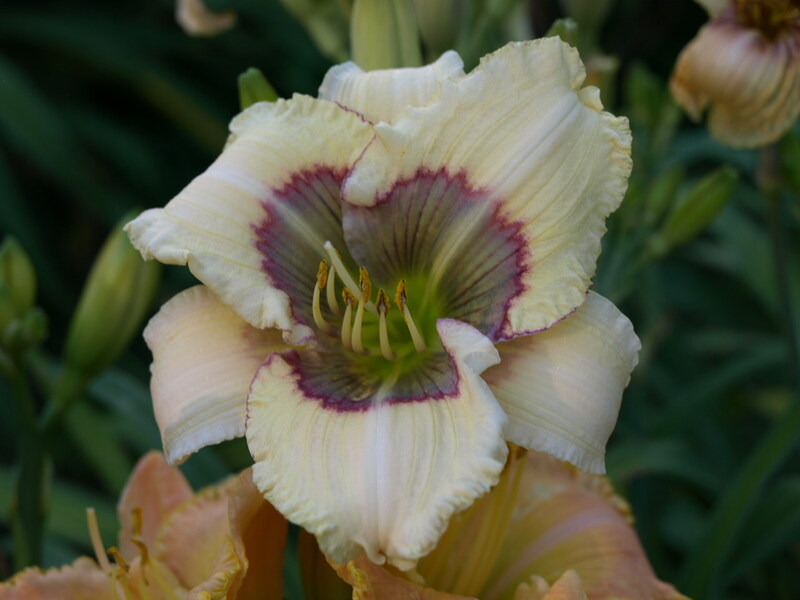 Its distinction lies in its season – around the time the rest of the daylilies are shutting down bloom for the season, LATE SUMMER HAZE starts, with a color and pattern that’s more common a bit early of mid-season. 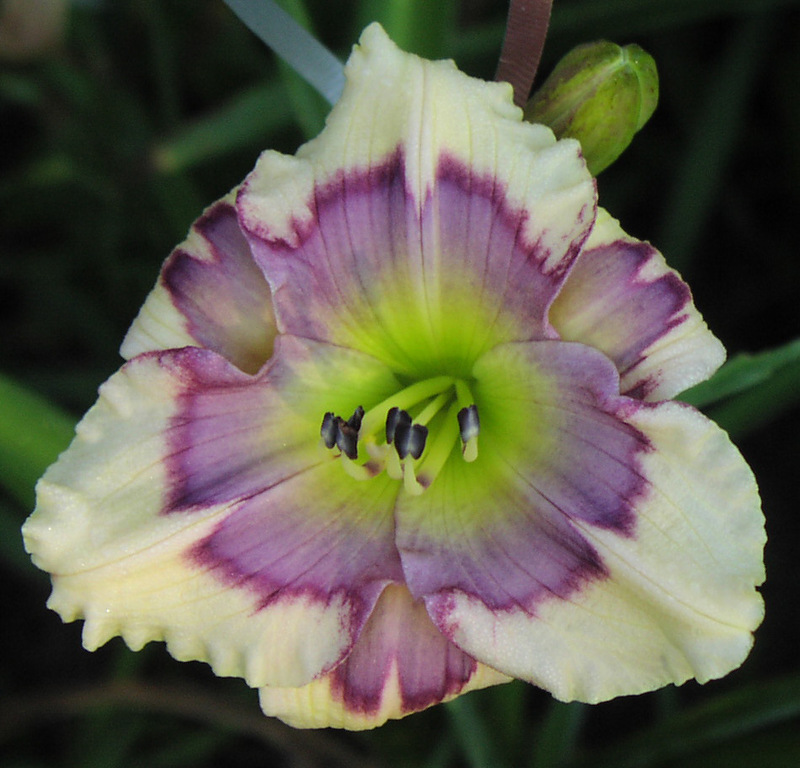 Light plum with complex patterned cream watermark/deep plum band, above chartreuse throat, and white edge around petals and sepals. Firm substance. Pod fertile, very pollen fertile. LAVENDER KALEIDOSCOPE is a fantastic parent for complex patterned and edged seedlings. We have used it with everything from minis to giants, and it puts its patterning mark on everything. Our seedlings include many direct LK kids, and many more of its grandkids and great-grandkids. (Megan Skinner, registered 2004, intro 2004) EarlyMid Dor Dip, 24”, 3.75” ((SILOAM URY WINNIFORD x SILOAM FAIRY TALE) X JASON SALTER) Not fragrant, bud count 15 on two-way branching, easily fertile both ways. Reblooms. LEMON SHADOWS is a melon-lemon cream daylily with a complex eye in a pattern of grape and cream, over a green throat. 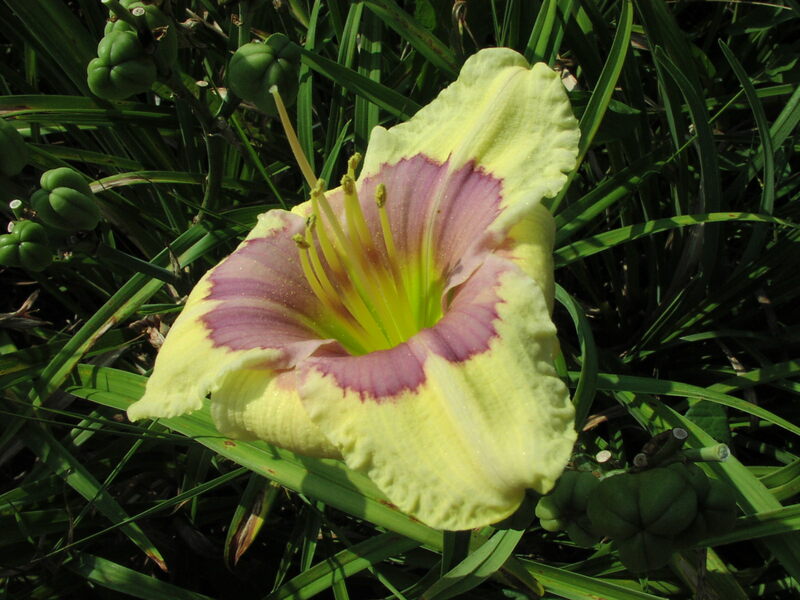 Among patterned daylilies, LEMON SHADOWS is unusual in that the pattern is stable, not changing with overnight or daytime temperatures. The clump looks wonderful in front of the red maple. Margali’s Matrix is another Shining Eyes kid in the Darkover name group. Cream with lavender eye, raspberry pencil edge, and chartreuse throat. (Megan Skinner, registered 2008, intro 2009) Mid Dor Dip 25”, 4.25” Seedling D02-008 (LAVENDER BLUE BABY X (BABY BLUES X PRISCILLA’S RAINBOW)) not fragrant, 22 buds on 3-way branching, fertile both ways. Purple with bright bluish-lavender watermark above green throat, with pale lavender edge on petals and sepals. 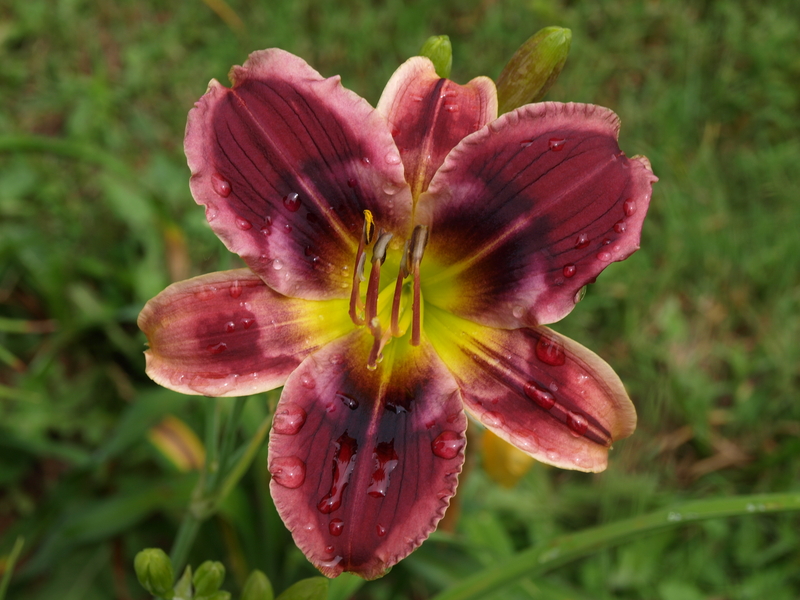 Cold morning opening, early morning opening, firm substance and extended bloom. One of my rare Biblical introduction names – mazel tov to Carol and Phil. (Megan Skinner, registered 2004, intro 2009) M Dor Dip, 30”, 5.5” seedling D361 (BARBARA MITCHELL X JANICE BROWN), fragrant, bud count 21 on 4-way branching, fertile both ways. 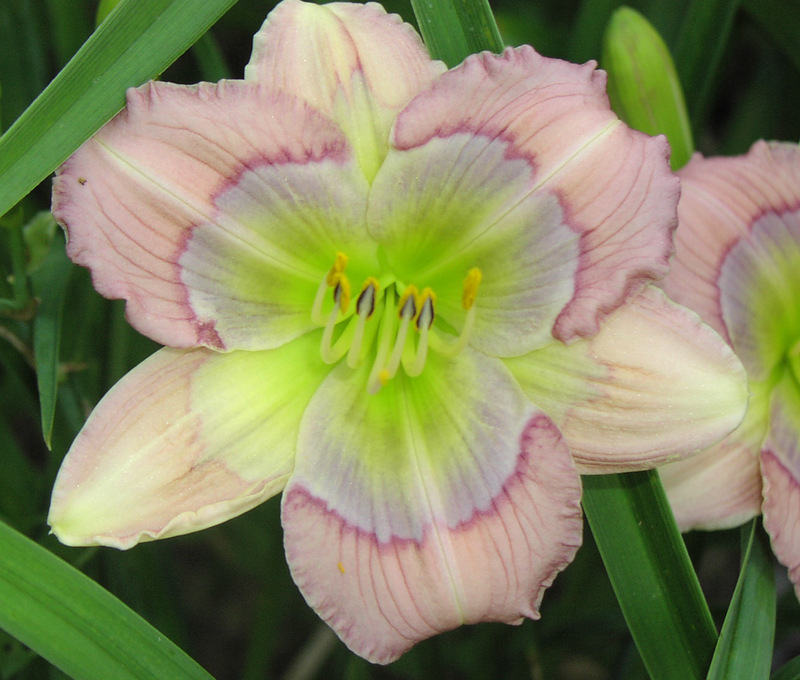 MY NIECE KATRICE is a light lavender-pink daylily with lavender eye above chartreuse throat and structural “rays” from the throat on both petals and sepals. It’s a poor opener at start of season and on cool mornings, but an excellent parent for huge greenish throats and those structural rays on the petals. (Megan Skinner, reg 2005, intro 2007) ML Dor Dip, 20”, 3.5”, sdlg D917W ((ENCHANTER’S SPELL x BABY BLUES) X ((SILOAM URY WINNIFORD X SILOAM FAIRY TALE) x BABY BLUES) fragrant, bud count 14 on 2-way branching, nocturnal, fertile both ways. NAVY JAG is cream with metallic lavender-slate eye and raspberry-purple pencil edge above green throat. 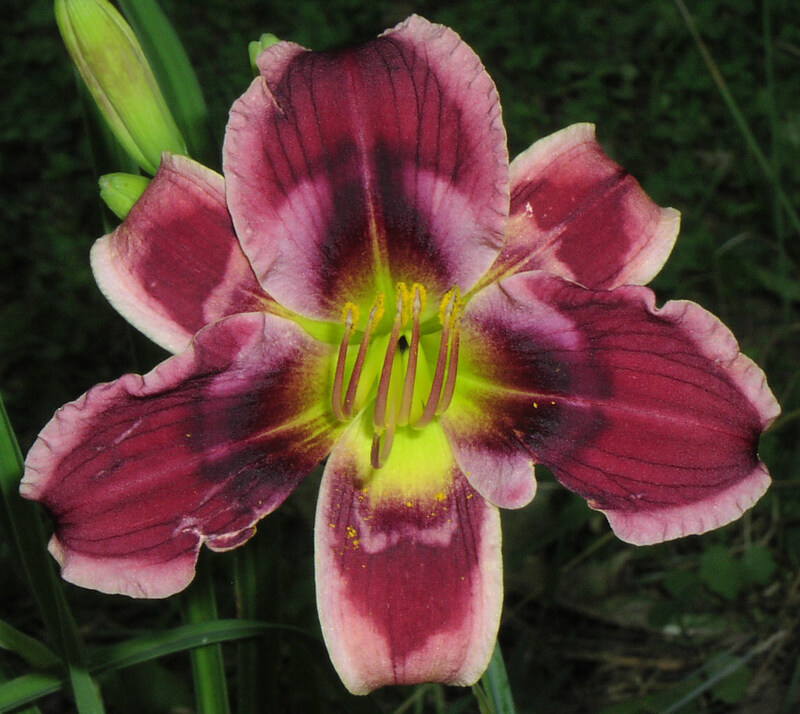 Sepal patterns are especially dramatic, and NAVY JAG is an outstanding parent for patterned daylily hybridizing. (Megan Skinner, registered 1999, intro 1999) EM Sev Dip, 24”, 4” ((SILOAM URY WINNIFORD x SILOAM FAIRY TALE) X IF) not fragrant, 23 buds on 3-way branching. 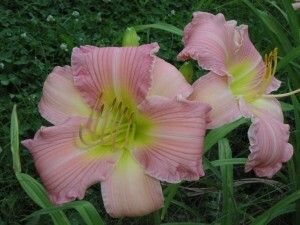 Extended bloom Extremely vigorous grower. 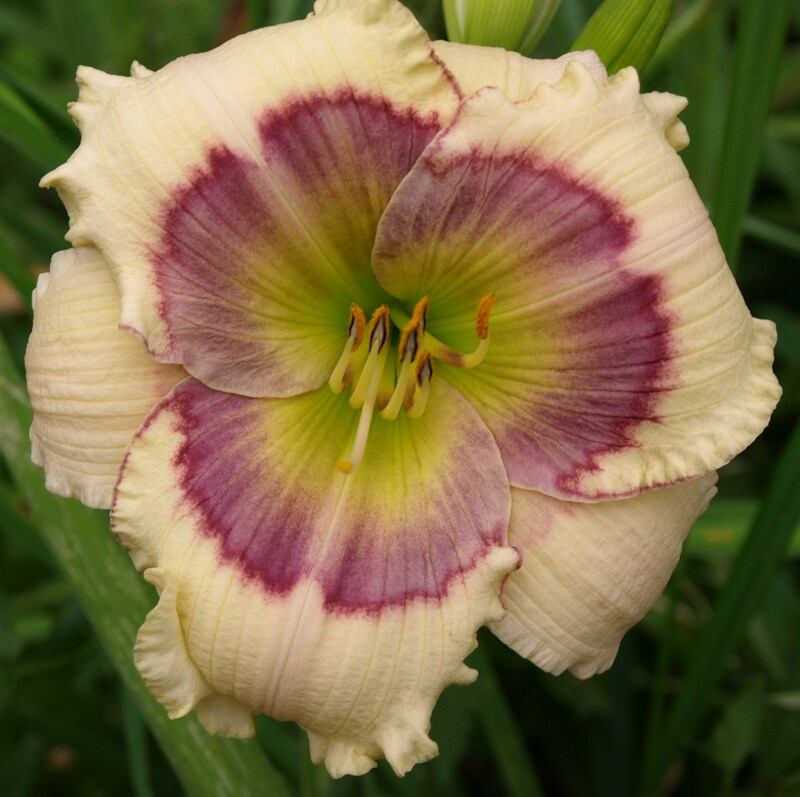 Light lemon flower with an intense lavender eyezone that is highlighted with violet pencil edge and lemon midrib, over yellow-green throat. SHINING EYES got its name because it was the first of our seedlings in which the eyezone, when viewed at a certain angle, looks metallic because of the way it reflects light. This iridescence only appears sometimes, but we have gotten the trait to show more intensely and consistently in its seedlings. Pollen sterile, but pod voracious – and you don’t have to worry about self-sets! Descendents over the past decade have included “blue”-eyed and patterned offspring, as well as lavender-metallic-eyed ones. The pod parent of SHINING EYES was one of half a dozen newly-sprouted seedlings Mike Kelly brought in to work to give to Ron, back in1987. More of its history on ANNEALED METAL EYE, one of SHINING EYES descendents. Much of our dip program started from those first spouts. Wow – what a gift! (Megan Skinner, registered 2004, introduced 2004) H 19” W 4” Mid Dip Ev Sdlg D510 (ENCHANTER’S SPELL X BABY BLUES). Fragrant, 15 buds on two-way branches. Cold morning opener. Pink-lavender with slate-lavender eye and maroon pencil edge over green throat; chartreuse throat color extend in an arch far along the sepal. SLATE BELT is tender in our zone 6 garden, and we don’t list it for sale. However, since it was a useful ancestor for “blue” eyes, we’ve used it in our program. Ironically, if it makes it through the winter and early spring all right, it handles cold just fine – one of our most beautiful photos, shown in a clump shot, was taken at 53F.